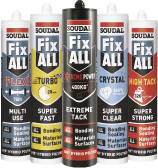 The most extreme of the Fix All Range, you can count on this adhesive to fulfill all your bonding requirements in the most simple ways. With an initial tack of 400 kg / sqm, you just apply and press, and the extreme tack ensures it holds up immediately without sliding. Extreme tack means it can hold 400 kg / sqm in its initial bond! Bonding in car bodies, caravans, containers. What’s the meaning of "tack"? Initial tack means how much weight an adhesive can support at the moment it bonds. Fix All Xtreme Power’s extreme initial tack of 400kg / m² means that it can support 400 kg with a bonded surface area of 1 square metre right at the moment you press the materials together. This support means that the adhesive will hold it up without sliding or dropping. However, the materials can still be moved if external force is applied. This is in contrast with final bond strength, which is achieved when the adhesive has fully cured and the materials can no longer be moved. The final bond strength of Fix All Xtreme Power is 2.10 N/mm², or 210,000kg / m² (DIN 53504).